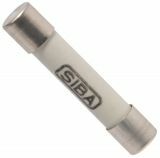 With more than 60 years of experince in the manufacture of fuses, the German firm SIBA is well recognized and well-known brand all around the world. Its rich portfolio includes more than 4,500 types of fuses - from miniature fuses necessary to protect the electronic components to connectors for medium and high voltage energy. SIBA's fuses meet all the requirements of all international standards such as IEC, EN, VDE, DIN and UL. The product's range made by SIBA is always needed at the heart of a building of any device which requires a good protection. They protect unobtrusively the staff of accidents and ensure that your machines are optimally protected and that your enterprise systems are reliable and secure. With their high quality, company patented products and daily monitoring of the industrial production process, SIBA can ensure that their fuses are always ready and reliable when you need them. SIBA fuses are important to be used before any major damage to the equipment to occur. Seen in this light, the fuses are very important investment, so SIBA promises German quality and precision without any compromises. VIKIWAT Ltd. offers a variety of German fuses with brand SIBA. In our store, you can find in stock quantities and a variety of different ceramic fuses and other types of fuses at affordable prices and quick delivery. Ceramic fuse 6.3x32mm 2A with time delay Melting ceramic fuse 6.3x32 mm with average break time. Rated current 2 A, maximum working voltage 500 V.
Ceramic Fuse 6.3x32 mm, 5 A Ceramic Fuse 6.3x32 mm, with rated current 5 A and operating voltage 500 V.
List Price 0.75лв. VAT Incl. 0.71лв. VAT Incl. 0.67лв. VAT Incl. 0.63лв. VAT Incl. 0.60лв. VAT Incl. Ceramic Fuse 6.3x32 mm, 6.3 A Fused ceramic fuse 6.3x32 mm with average break time. Rated current 6.3 A, maximum working voltage 500 V.
List Price 0.70лв. VAT Incl. 0.66лв. VAT Incl. 0.63лв. VAT Incl. 0.59лв. VAT Incl. 0.56лв. VAT Incl. Time-lag Ceramic Fuse 6.3x32mm, 8A Ceramic Fuse 6.3 x 32 mm, with rated current 8 A and operating voltage 500 V.
List Price 0.75лв. VAT Incl. 0.71лв. VAT Incl. 0.67лв. VAT Incl. 0.64лв. VAT Incl. Time-lag Ceramic Fuse 6.3x32mm, 10A Ceramic Fuse 6.3 x 32 mm, with rated current 10 A and operating voltage 500 V.
Time-lag Ceramic Fuse 6.3x32mm, 16A Ceramic Fuse 6.3 x 32 mm, with rated current 16 A and operating voltage 500 V.
Ceramic Fuse 6.3x32 mm, 20 A Ceramic Fuse 6.3x32 mm, with rated current 20 A and operating voltage 440 V.
Ceramic Fuse 6.3x32 mm, 25 A Ceramic Fuse 6.3x32 mm, with rated current 25 A and operating voltage 440 V.
Ceramic Fuse 6.3x32 mm, 32 A Ceramic Fuse 6.3x32 mm, with rated current 32 A and operating voltage 250 V.